Tim Kaiser live at Circuit Benders’ Ball 2010. Photo by Stephen Zerne. Yesterday’s Circuit Benders’ Ball at Open Lot was an enormous success. Both workshops were completely filled, and every performance was brilliant in its own unique way. Garbed in tribal space outfits, CMKT4 emerged out of a smoky sliding van door and proceeded to mesmerize the house. Thriftsore Boratorium brought the show out to the loading dock and handed everyone a transistor radio that broadcast the live feed. Tim Kaiser set up his gear on the floor for an intimate and breathtaking ambient performance. Robbie Hunsinger, Blight Side of Life, Ben Marcantell, DaveX, Jeremy Walker, and Freya West were all amazing, as were the many talented visual artists. For tonight’s podcast, we give you the final performance of the night: Theatre Intangible Live with Tim Kaiser, 1/2 Mang (Thriftsore Boratorium), DaveX, Jeremy Walker, and Lola Wilson (A Parade). Most had never played together and were asked to very quickly pick a single instrument for the performance. The results are quite cohesive, surprising given the performers’ varied styles; unsurprising given their razor-sharp instincts. I know I promised the Halloween Extravagana 3 this week. That will have to be bumped to next week. For now, enjoy this very fine live set from some of the best benders in the business. 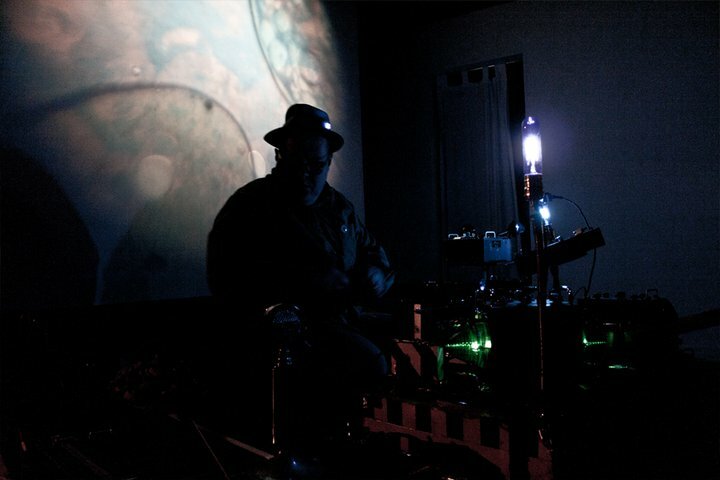 Tim Kaiser — Tim Kaiser builds experimental musical instruments and creates atmospheric sonic landscapes. He has been featured in Make Magazine, Wired, the AP and New Art Examiner. His video, installation and performance art projects have been presented in Germany, Brazil, Sweden, Hong Kong, Cuba, Canada, Philladelphia, New York and Chicago. His instruments are sought after by artists around the world. Thriftsore Boratorium — Out of Circuitastrophe Cincinnati 08, Karl the junkyardcatalyst and 1/2 Mang decided to start the Thriftsore Boratorium; a lab where people can come and experiment, work, troubleshoot, record, jam, circuit-bend, modify, design, make robots, etc. Thriftsore Boratorium puts their creations to task in their mind-bending live shows. They’re cooking up something special for the Circuit Benders Ball. Check out this great Robotic Barbie Sing-a-Long bend by Boratorium member 1/2 Mang. Lola Wilson — Co-founder of the Captain Beefheart/Art Bears-inspired A Parade (with T.I. all-star Cody Bottoms) and the experimental solo project I Am Pazuzu, Lola is a singer and songwriter with individuality, depth, and great talent. DaveX — a certified and licensed raconteur, DaveX is best-known as providing the real-life inspiration for Artax, the depressive horse featured briefly in the 1984 motion picture, “The Neverending Story.” Following his Emmy-nominated voice work on the animated spinoff series, “Artax’s Diner,” DaveX took full credit from his team at Bell Labs for the pioneering invention of various geometric forms. He is currently living off the royalities for the wildly successful “circle,” which he describes as “something like a curvy square.” Ordinary folks are encouraged to listen to a fifteen-minute looping audio biography of DaveX broadcast weekly at WDBX-FM and WSIU-FM on the programs It’s Too Damn Early and Sounds Like Radio. He also runs the experimental music blog Startling Moniker. Jeremy Walker — His work focuses on reclaiming process, material, and content. Jeremy Walker creates unconventional instruments by altering found electrical circuits. By manipulating the intended function of the circuit, he’s able to emphasize its hidden, organic qualities. Each work is intended to conjure a certain child-like curiosity to investigate, to touch and to learn. By inviting direct interaction between the viewer and sound, Jeremy enables the participant to take the place of performer. Jeremy graduated from Watkins College of Art & Design and is currently enrolled at Middle Tennessee State University to pursue a BFA in Sculpture.